The bee (Apis Mellifera) native to Europe and Africa is a social and domestic animal. Bees feed on nectar and pollens, where nectar is the prime source of energy and pollens act as supplements of proteins and other nutrients. The food source of larvae is pollens. Generally the bee colony consists of a single queen bee that is responsible for laying eggs, thousands of male bees called drones and thousands of worker bees, which are the sterile bees, and the young bee larvae called broods. Bees randomly searches for food source positions with good supply of nectar. Once a bee finds such a position, it goes back to the hive and communicates about the food source position by dancing in the comb. If the foraging bee finds the food source position close to hive, it performs a simple round dance and if the food source position is far from the hive, then it performs waggle dance. Waggle dance basically forms an eight like figure and the distance and the direction of the food source is indicated by this dance. The fastness of the dance conveys the distance. The inclination of the dance indicates the direction of the food source. If the food source is abandoned, then the bee becomes an uncommitted follower. The search cycle consists of three steps. In the beginning, some food sources are randomly selected by the bees and the amount of nectar is also determined. Then these bees return to the hive and share this information by performing the waggle dance. In second stage, each employed bee goes to the food source visited by her in previous cycle and then by means of visual information, chooses a new food source in the neighborhood. In the third stage, an onlooker bee visits the food source position depending on the nectar information shared by the employed bees. The food source with maximum nectar quantity is selected by the onlooker bee. After arriving at the selected food source, the onlooker bee, according to visual information, chooses a new source in the neighborhood of the selected food source. Once the food source is abandoned by the bee, a new food source is randomly selected by a scout and then the abandoned source is replaced by this new food source. Project financing is a method which is used to finance the large infrastructure and industrial projects based on the projected cash flow of the finished project rather than the investors own finance. It is a long term method. Project finance structures usually involve a number of equity investors as well as banks who provides the loan to the project. In other words we can say that project finance is a method of funding in which the lender looks primarily to the revenues generated by a single project, both as a source of repayment and as security for the exposure. It plays an important role in financing development throughout the world. This type of financing is usually for large, complex and expensive installations. Transportation system such as metro. Installation of a power plant, chemical processing plants, mines etc. Project finance is especially attractive to the private sector because they can fund major projects off balance sheet. It eliminates or reduces the lender’s recourse to the sponsors. It is treated as an off balance sheet. The leverage of a project is maximized. It avoids any restrictions or covenants binding the sponsors under their respective financial obligations. The credit standing of the sponsors is avoided by any negative impact of a project. The company can obtain better financial conditions when the credit risk of the project is better than the credit standing of the sponsors. It allows the lenders to appraise the project on a segregated and stand alone basis. The company can obtain a better tax treatment for the benefit of the project, the sponsors or both. It requires greater disclosure of proprietary information and strategic deals. It restricts the managerial decision making to some extent. It is substantially more expensive due to its non-recourse nature. Due to the creation of an independent entity there are higher transaction costs. It often takes longer to structure than equivalent size. Continuing from where I left my last blog. JIMS has been ranked among the top 10 leading management institutes of Guru Gobind Singh Indraprastha University. JIMS, Vasant Kunj is one of the premier management institutes in Delhi/NCR with ‘A’ Grade accreditation from NAAC. The ratings of any institute is based on the achievements of the institute in the field of academics, sports, cultural and co-curricular activities. In this blog. I want to highlight the sports achievements of the institute with a special focus on the Management department. The management department of JIMS, Vasant Kunj has produced a Gold Medalist in BBA (2013-16) Batch. In the field of sports, JIMS has done extremely well in 2017-18. Five students have won 5 Gold and one Silver medal in Inter College Competitions of Guru Gobind Singh Indraprastha University which is the highest no. of gold medals won by any college affiliated to Guru Gobind Singh Indraprastha University. Gaurav Gulia won Gold Medal in Body Building. Shubham kumar won Gold Medals in Cross country, 5000 mtr, 1500 mtr events. Abhishek won a Silver Medal in 400 mtr. 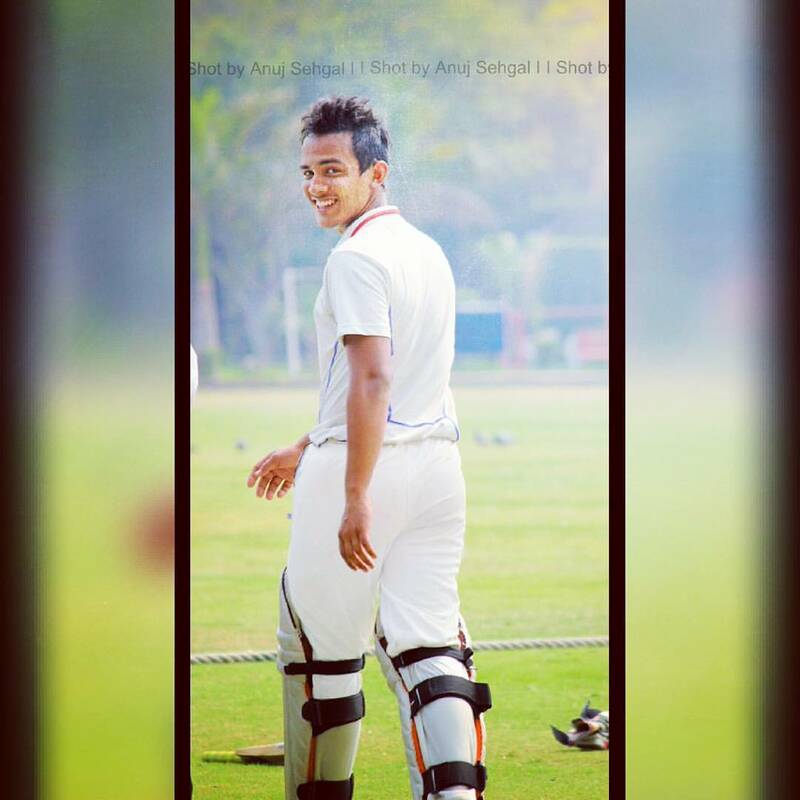 Deepanshu Bhandari captained GGS Indraprastha University’s cricket team in 2016-17. The placements of the students plays an equally important role in the rating of an Institute. I will leave you this time with a teaser on the placements. JIMS Vasant Kunj students get placed through on campus interviews in well- known companies with an attractive package. Look for my next blog for more information on campus placements. Living in the digital world, it becomes important to have website. A website is not just a source of information; rather, it makes your presence evitable in the digital world. And, most importantly, it helps in growing the business opportunities. The way it is important to have a website, similarly, it is also important to maintain the structure of the website. Its internal structure and the health of its internal structure are almost similar to the health of a human being; thus, it becomes important to take care of the health of a website. YSlow Scores- YSlow score analyses the reasons for low page speed of a website. One can significantly reduce the page loading times and improve the user experience by running the tool and implementing its checklist-style suggestions. Its testing is also happens to be free and open source. The optimize speed of a page to load is 3s. Page load details- Time taken by a webpage to download and display the content is called page load time. User experience & engagement are the key performance areas which are to be given at most importance while designing a website. Increased duration of page load time will have an +madverse effect on business operations. Optimal page load time is 6.5 seconds. Page Size: Page size is the block of stored memory. This affects the total amount of space and memory needed while the web page is running. This is also named as page weight. In other words, it is called an overall size of a web page. The optimal average Total Page Size is 2.88MB. HTTP request: HTTP stands for “Hypertext Transfer Protocol”. It contains text, images, and multimedia that exist on that webpage. When a web browser (client) sends a request to the server for a file and, server provides a response is called Http request Http request can be reduced by combining files and CSS sprites. The average number of Requests is 87. SEO: SEO means “Search Engine Optimization”. It is Process of sending repeated and measurable signals to search engines to verify whether the page is worth showing in Google index. SEO can be of great help to an organization business which has a web address, blogging or online stores to meet their business objectives and help business grow. SEO plays a vital role as users trust the organizations that have got a good presence over internet and organization during SEO comes under top categories by having its SEO done with keywords etc. To improve the productivity and performance, nowadays companies are using software robots to perform routine, rules-based service processes. With a careful implementation of such software (robots) for automation, high-performing human-robot teams can be developed. This type of process of automation of services is also known as Robotic Process Automation. It is sometimes called a software robot or bot which imitates a human worker, logging into applications, entering data, calculating and completing tasks, and logging out. RPA software is usually not a part of an organization's IT infrastructure but, it sits on top of it, and enables a company to implement the technology quickly and efficiently -- all without changing the existing infrastructure and systems. The main difference between other automation methods and RPA is the ability of the RPA software to be aware and adapt to changing circumstances, exceptions and new situations. Once RPA software has been trained to capture and interpret the actions of specific processes in existing software applications, it can then manipulate data, trigger responses, initiate new actions and communicate with other systems autonomously. Also a standard interface along with the deployment of software is used in RPA without modification to the applications or the systems which is being automated. In spite of the fact that RPA software is a new technology, but it is neither expensive nor complex. RPA software is particularly useful for organizations which require effective and effortless integration and interaction among many different and complicated systems. The industries which use labor on a large scale for general knowledge process work, where people are performing high-volume, highly transactional process functions, will enhance their capabilities and save money and time with robotic process automation software. It is the application of technology that allows employees of a company to configure computer software or a “robot” to capture and interpret existing applications for manipulating data, processing a transaction, triggering responses and communicating with other digital systems. Similar to industrial robots which are remaking the manufacturing industry by creating higher production rates and improved quality, RPA “robots” are transforming administration of business processes, workflow processes, IT support processes, remote infrastructure and back-office work. RPA provides significant improvements in accuracy, cycle time and increased productivity in transaction processing as it elevates the nature of work by removing people from dull, repetitive tasks. RPA technology can be applied to a wide range of industries. The financial sector followed by healthcare and telecom & IT are embracing RPA. The major reason of this is the large volume of data entry and switching among various applications. By automating processes i.e. data entry, purchase order issuing, creation of online access credentials, or business processes expedite back-office tasks in supply chain management, procurement , accounting, finance, customer service and human resources etc. Remote management of IT infrastructures can be automated to consistently investigate and solve problems for faster process throughput. Service desk operations and the monitoring of network devices can be improved drastically by RPA. Separating scalability from human resources allows a company to handle short-term demand without extra recruiting or training. RPA with capabilities of providing benefits such as enhanced accuracy, compliance, cost saving and scalability, is emerging as a disrupting technology. These tools are less expensive than the full-time employees, industry experts have been expecting RPA to disrupt the conventional Business Process Outsourcing (BPO) model and alter the global outsourcing industry. A Global Market Insights Inc. report expects the RPA market to reach $5 billion by 2024. The increased adoption of RPA technologies by organizations to enhance their capabilities and performance and boost cost savings will apparently drive the growth of the robotic process automation market in next 4-5 years. The Semantic Web is an initiative by the W3C in a collaborative effort with a number of scientists with the goal of providing machine-readable Web intelligence that would come from hyperlinked dictionaries, enabling Web authors to explicitly define their words and concepts. The idea allows software agents to analyze the Web on our behalf, making smart inferences that go beyond the simple linguistic analysis performed by today’s search engines. Tim Berners-Lee calls the resulting network of Linked Data the Giant Global Graph, in contrast to the HTML-based World Wide Web. Berners-Lee posits that if the past was document sharing, the future is data sharing. Conceptually the SW represents a layered Architecture (Fig 1), where each level provides different degree of expressiveness. The bottom most layer allow user to provide a controlled vocabulary and namespaces. Next layer, Resource Description Framework (RDF) represents information about resources in the World Wide Web. It consists of a triplet – resource, property and value. 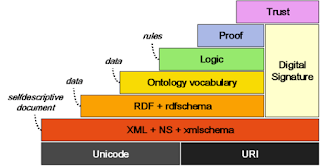 Ontology vocabulary, the next upper layer, adds more semantics to RDF by allowing a better specification of constraints on concepts. The rules for explicit inference are established by Logic layer which are then executed by the Proof layer. The top most layer, Trust provide mechanisms to imbibe trust in a given proof . The semantic web as whole, acts as a decentralized knowledge bank that provides meaning to a learner's search and thus allows extracting most appropriate learning material.